Rarely seen in large flocks, as for example are the highly sociable Rooks, Ravens are more often encountered in pairs. With a body length of about 65cm and a typical wingspan of 140cm, Ravens are completely black and have heavy beaks and long, wedge-shaped tails. 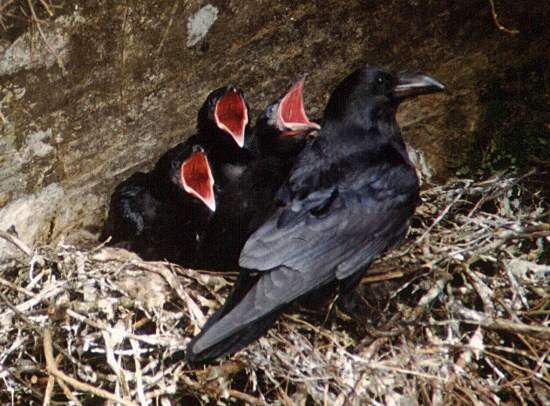 The rock-ledge nest site chosen by these Ravens, the largest members of the crow family, is typical of the species. There are numerous historical and mythological references to the Raven, nearly all with dark connotations. It is said that if the Ravens were to leave the Tower of London then the Crown the monarchy, or perhaps the state) would fall. In Edgar Alan Poe's narrative poem The Raven, one of these birds, traditionally associated with loss and bad luck, talks to a young man who is lamenting the loss of his beloved Lenore. Among the many chilling lines are these: "Tell this soul with sorrow laden if, within the distant Aidenn, It shall clasp a sainted maiden whom the angels name Lenor....” Quoth the Raven “Nevermore.” A prophesy repeated many times throughout the poem. This impressive bird can be seen throughout the northern hemisphere. The Raven is fairly common resident bird throughout most of Britain. The greatest concentrations are in the west and the north, and they are particularly plentiful in West Wales where, despite appearing mainly either solitarily or in pairs, on occasion we see up to 15 of them circling overhead. Their throaty croaks echo up and down the valleys. Ravens can also produce lots of other sounds, however, including a popping noise like that of a cork being removed from a bottle. In captivity they have been reported to imitate the human voice. 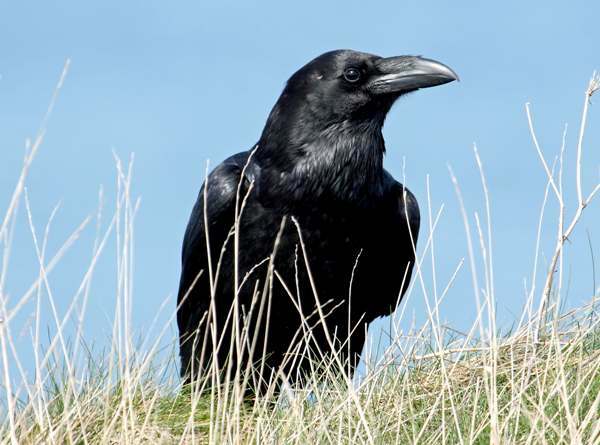 Although carrion and small mammals are their staple diet, Ravens will also eat eggs, worms and even fruit and grains. Because of their large size, Ravens have few natural predators; however, some birds of prey do try to steal the eggs, and adult Ravens defend their nests fiercely using their sharp beaks and claws. The nest is made from sticks, and lined with grass and sheep's wool. In wooded valleys and more lowland areas they will also nest in large trees. The female Raven lays three to seven brown-blotched, pale blue-green eggs, which she incubates for up to three weeks. The young usually take five to six weeks to fledge, during which time both parents feed them. The family usually stays together until the young are seven or eight months old. Although in protected environments, such as the Tower of London, Ravens have been known to live for up to 40 years, in the wild their typical lifespan is 10 to 15 years.